Raise your hand if you remember how you first got into Magic. I was fourteen, and my friends and I haunted the local game shop, looking for new Vampire: The Masquerade books. The girl who worked there took a shine to us, gave us each a bag and a couple of dice, and sold us each a starter deck. I had three friends to play with, but it was all I needed. I was hooked. Commander can be difficult to get into for anyone of limited means. 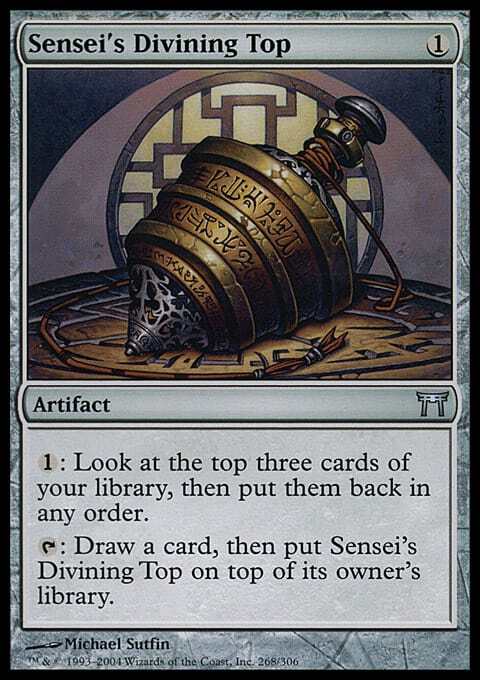 “Staples” such as Sensei's Divining Top and Maze of Ith are expensive and can be hard to get a hold of. 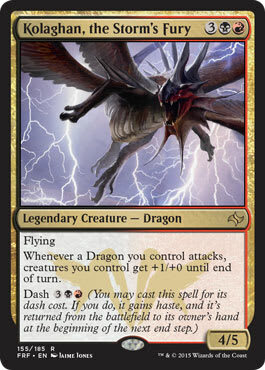 Even super-powered commanders—Kaalia of the Vast comes to mind—are worth a pretty penny and may not be accessible. Most shops, however, support Standard, and many players develop a card pool playing Limited. Others pick up unused cards from friends or older siblings. Some trade with small groups of friends. The choice rares—Dragonlord Ojutai and Deathmist Raptor—may be hard to acquire, but a clever Commander player should be able to find more accessible cards. So let’s do a couple of things today. First, we’re going to build a Mardu deck using nothing but Standard-legal cards (don’t worry; the $75 budget is still in place). By limiting the pool this way, I hope to make the cards more acquirable. Second, I’m going to delve a bit more deeply into beginning deck construction. There are a lot of ways to build a deck, but when building with a small pool, some basic guidelines can help make sure that you have a hundred-card stack that works together and does some nifty things. In Mardu in Standard, we have two choices. While Alesha, Who Smiles at Death is very cool, to me, the choice was clear from the moment I first laid eyes on him. When thinking about building a Commander deck—especially your first—it’s important that the commander jump out at you. This guy’s great; he’s three colors, so we have a lot of options for spells. His 7 power means three hits and an opponent is dead; plus, his power-to-mana-cost ratio is good (anytime the power is higher than the CMC, it means good value). Haste equals surprise, attacking each turn propels the game forward, and indestructible on our turn makes him awfully hard to block. Plus, he gets bigger! These all seem like good things in a commander. Then, we decide what we want to do. Do we want to win with our commander? In the red zone with other creatures? Combo off? Are we pushing the game forward, forcing the other players to act, or are we trying to slow the game down until we can create inevitability? Perhaps, like last episode, we want to do something completely different, but most of the time, this step is about figuring out how we want to win the game. Zurgo is aggressive. That 7 power and haste are good reasons to go “Voltron” (put Auras and Equipment on the commander and win with commander damage). But our limited card pool doesn’t give us a ton of great options. Evasion is elusive in these three colors, and a lot of the Auras are bestow creatures, so the effects are expensive. Zurgo, though is an Orc Warrior. Anyone who’s played Khans of Tarkir Limited knows Warriors was a reasonable archetype to draft; there’s a lot of support for them. There are good creatures and some token-generation, and if we can create enough positive interactions, we could have ourselves a deck. So we’re doing Warrior tribal with Zurgo Helmsmasher. Now we take a look at My Deck Tickled a Sliver to start building. I start with forty lands and assume I can cut later if my curve is low (note that forty lands in a hundred-card deck is the same as twenty-four in a sixty-card deck). 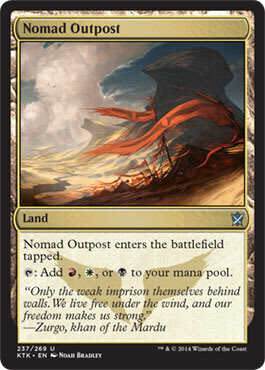 Mardu Banner and Kolaghan Monument help fix along with Nomad Outpost, the three Temples (Temple of Malice, Temple of Silence, and Temple of Triumph) and the three life lands (Bloodfell Caves, Scoured Barrens, and Wind-Scarred Crag). There’s Evolving Wilds, too. Draw is harder. Black is secondary in card-draw (along with green and behind blue), but that means over time, not necessarily now. We have a few helpful spells though. Here’s where we deviate from heads-up formats like Standard—cheaper doesn’t always mean better in multiplayer, and we sometimes prefer a stronger effect. So, we keep Read the Bones and Vulturous Aven—we look at four cards or we gain a body—and drop Sign in Blood. Damnable Pact is a solid way to draw a bunch of new cards, and Grim Haruspex will keep our hand full if it survives a few turns. Threats are next. An undercosted 9/9 with no abilities is actually pretty bad in Commander, where kill spells are cheap, Wraths are common, and opponents have 40 life. We want value with a threat tacked on—especially when building with limitations. Our Warriors are going to make quite the fighting force, but creatures like Butcher of the Horde let us use our outclassed tokens to regain some precious life or deal some unexpected damage (we can also live the dream with Bloodsoaked Champion—sac the Champ to the Demon for haste, attack with the Demon, return the Champ. Repeat next turn). Ob Nixilis, Unshackled flies, tramples, and grows each time a creature bites the dust, and it punishes any player who searches too much. Gods are scary if they come online. And something like High Sentinels of Arashin can be a sudden, serious problem for opponents who aren’t paying attention, while simultaneously helping out the team. Look for evasion and big effects that affect the board. We don’t have the best answers ever, but there are always answers. Ashen Rider is amazing as exiler and threat in one, but even spells like Valorous Stance and Mardu Charm can kill something. Silence the Believers is great even outside of Standard, and Ride Down has to be there for flavor alone. We’ll also surprise the heck out of someone when he or she blocks our Ankle Shanker, hoping to stop us from giving our team two awesome abilities, and the Shanker just rides the player down. We even have a whole bunch of Wrath effects to choose from. Pick favorites; in this build, we have End Hostilities, Extinguish All Hope, and In Garruk's Wake. The job is to make sure we have a good mix of spot removal, mass removal, and artifact/enchantment hate, as available. Synergy is where decks like this one live and breathe. When we don’t have access to the most powerful cards, we can create power by making our cards work together. Ankle Shanker is a good example—even with only three or four other creatures, our dudes are suddenly doin’ damage or killin’ guys. Raiders' Spoils is similar, giving a power boost and granting value when we connect. Alesha can return fifteen different creatures, including Dutiful Attendant, who can return something else. Mardu Strike Leader makes more guys, Flamerush Rider lets us gain multiple uses from the same guy (imagine that with Ashen Rider out! ), and Brutal Hordechief lets us control the battlefield, even when it isn’t our turn. Mardu Ascendancy may not make Warriors, but they’re still creatures attacking. 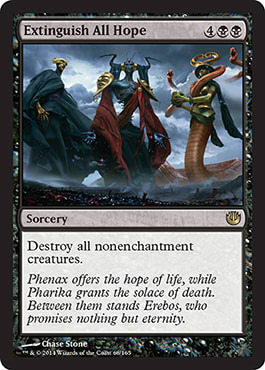 Dictate of Erebos will keep other players even with us, and Dictate of Heliod is quite the surprise to the opponent who thinks he or she just survived with 8 life. Look for high-impact effects that work well together as well as alone. When there are more than one hundred cards in the pile, look at the curve. With forty lands, there should be a few strong 1-drops, the heaviest points should be at 3 and 4 mana, and it should taper down to a few 6s and very few spells higher than 7. That way, you’ll have a good mix of effects as you play through the game. I want to share the last few cards I cut; all are reasonable choices, so feel free to jam ’em if you got ’em. I also cut a Minotaur subtheme—a lot of them are Warriors, but I felt it was too scattered. If you have a bunch of on-color Minotaurs, though, go for it! If you don’t care about staying within the Standard card pool and have some extra cash, Butcher of Malakir, Stonehewer Giant, and Kazuul, Tyrant of the Cliffs are all Warriors. Figure of Destiny becomes one. Obsidian Battle-Axe might work. Better lands (Command Tower, Cavern of Souls, Rogue's Passage) are always good. That said, a deck like this is more like looking at a Draft archetype than a carefully-tuned Modern deck. This is one of the directions you can go, and it’s one stack of one hundred you could pack. But if you opened Indulgent Tormentor, run it. Maybe Sidisi, Undead Vizier was your promo at the most recent prerelease—there’s nothing wrong with the occasional Demonic Tutor effect. 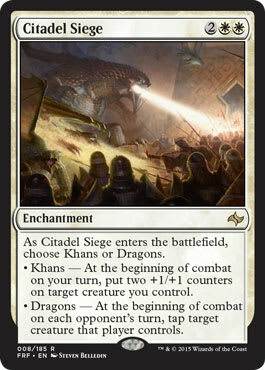 Was Citadel Siege handed to you after someone’s Draft went badly? Sure! Just watch the curve, and make sure the card has an impact—it should be very strong on its own (Kolaghan, the Storm's Fury) or work well with the theme (Boltwing Marauder). By the way, with this stack, attack for value as much as possible, and hold back with removal, only using it when necessary. With cards like Ride Down, Rush of Battle, and Dragon Throne of Tarkir, it can steal some games right out from under the noses of other players. Any other suggestions from the deck-builders out there? What is your process? What do you suggest to newer players looking to get into the format? Please share your wisdom in the comments! Don’t let a limited budget or limited card pool keep you out of Commander. With some careful choices and some ingenuity (and possibly a few good trades), a solid deck is already in your collection, just waiting to be sleeved up!